Update: Google has now released the Gboard app to the UK. If you live in Australia you're going to have to wait a little while longer and if you're on Android there's no update either. 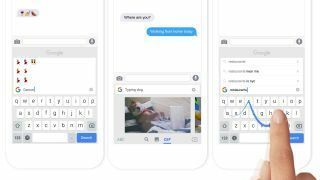 Original:Google has launched a new keyboard that includes an integrated search feature, making it even easier to share links, images and pretty much everything else you find online. The keyboard – officially named the Gboard – works much like your average keyboard, but also includes a small 'G' in the top left which you can tap to search the internet. A product expert at Google has taken to a forum to explain the Gboard app will be coming to Android at some point in the future too. Bri Connelly wrote, "Working on the best way to bring the same functionality to Android right now!" You can download the Gboard app direct from the Apple App Store now.